some pretty wacked out things but, nope, not this. Simply hot glue the two books together, mark where you want your hole and using a 3" drill bit -- drill away! Do take it slow and easy. I used an empty sour cream container to pot my little plants after I slipped it in the hole, marked it, and cut it off to fit. If you enjoyed this post (and, gosh, I hope you did) please BECOME A FOLLOWER! Wow - what a unique idea! I love it! Oh, what a cool looking project, Lindy. Oh yah ... this works! LOVE IT! Lindy,what a wonderful idea!! I love the way you placed the birds too with it! My friend, I love your book planter! What a creative idea! You know, we often set a little plant up on an old book in a vignette...so this is awesome! Thanks for sharing this sweet project with us and the tutorial as well! Hmmm...now I'm thinkin'...what can you use all of those paper circles for! There's got to be a great project for those as well! Hehe! I love this fun idea! How creative! That looks like a fun, easy project. Very Martha-ish. What a creative idea! I love how it turned out. The birds perched on it and next to it give it just the right finishing touch. What won't you think of next?? I can't wait to see what you do with those page disks now. Blessings, friend. Great idea Lindy...you made a "book" cache pot...very cleaver! You make it sound as if drilling holes in books is easy. I've done it for several different projects and it is messy and tricky (but definitely worth it). This is a super-cute and very fresh idea!! That is very pretty and the bird is the perfect touch! Great idea! I love this idea! Brilliant :) I just saw a wreath made with circles from a book. She used a cutter but you just made that step so much faster! What a neat idea! I am continually amazed by what people are doing with old books! Thanks for sharing...I'm visiting from Somewhat Simple! This is one of the cutest ideas I've seen. This is one creative project. Wouldn't this look so beautiful in a bookshelf... my bookshelf! What a fun and inspiring stop! Love it!! Your vignette is beautiful! I would have never thought of this, but I totally love it... I will have to try this really. This is on my list of things to make...love how yours turned out! Don't you just love making things using old books?! love this! It turned out beautifully! That is so cute! I love the bird. I wonder if it's looking for a worm? He needs a gummy worm! That's what my kids would say anyway... So nice to have had you stop by! Now I am your latest follower! I almost cringe at the thought of destroying a book, but it's such a cute and clever idea!! Can't wait to see what you do with the leftovers! How clever are you! I can't wait to see what you do with the paper circles. You amaze me! You're so innovative! Hi....visiting and now following from Carfty Soirre! I absolutely love this ~ never would have thought of it, but it is amazing!! How lovely! You always come up with such wonderful and creative ideas. I love birds, so I especially like this one. Very cute. And the books used could either fit a theme or season, or be old gardening books where the pages got wet. What a "novel" idea! I love the way you used the planter in your display with the birds. And look at all those goodies left over for another creative project. Can't wait to see what you do with those. Thanks for linking to my party. I look forward to seeing what you link up each week. This is such a great idea and you can use the circles for another project. I made some of the picture frames out of books awhile back. They turned out great. Great job, thanks for sharing. What a great idea!! Hey all that book innerds...you could string them with drilled erasers, pencils, rulers, apples, etc and make a garland for school theme! Fantasitc! I've never seen anything like this before. Love it! Pretty wicked cool idea. Love it! This is so creative, I love this idea! You are just too clever! And the birds are so cute in you vignette! wow! so creative of you and turns out wonderful project with beautiful photos! thanks for sharing! This is just precious. Let's see...you'd have to put the book planter in a sunny spot for the good of the plants...or...use faux to be able to put anywhere. So so cute. Aren't you clever! I ❤ this idea. That is very pretty. And you could use those left over pieces for a wreath or something. Very nice! How creative!! I love this idea and the little birds add that extra touch. I love that idea! I've been really into book crafts lately and this is a new one to me! What a cool idea! It would never have crossed my mind. This is so neat! I'd love for you to come link up to my party this weekend. That is ADORABLE!!! I love it! And I want to make one right away! Thanks for linking with While He Was Napping! I'm so smitten with this idea! Hope you'll come link up again next weekend! I love the look of old books and this has taken it to a whole new level! So creative! 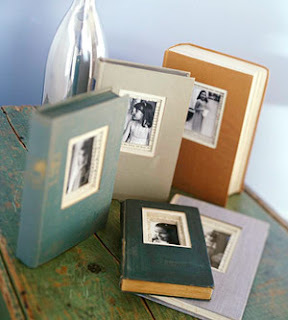 What a very cool idea--I love old books and projects made with books are even better. Thanks for sharing at Beyond the Picket Fence's Under $100 linky party. Hi Lindy, love this idea. Sooo, what are you going to do with the little rounds of paper??? hmmm? Seriously the book planter is way cool. Wow! What a very cool idea! I am featuring this at somedaycrafts.blogspot.com! Grab my "featured" button. Gosh, that's brilliant! I'm also eager to see what you do with the paper "holes" that were left over. That is so very creative. great job! How cool is that! And those round pages pieces are awesome, too! Genious! Way to go thinking outside the box like that. Love it! Whoa! That's one clever idea! I like it! Cleaver idea. What a clever and creative idea. Just don't cut any holes in first editions! Thanks for sharing. This is my first visit to your blog via MI4M but I'll be returning. cute idea. I passed this on to my two engage sisters for a possible wedding centerpiece idea! very unique! Like this a lot! So pretty! What a cute and wonderful idea! Love it! Hi Lindy! Oh, this is precious! I love it! What a great idea and you made it seem easy. I'd probably drill holes in my tiny fingers. That's a very clever idea! It turned out wonderfully! That is so clever! It looks great. I'm really enjoying your blog. I did the book photo thing last year for christmas and that was fun. I'll certainly give this little project a try. I buy books specifically for their colors at the good will, so I've a ton to choose from! 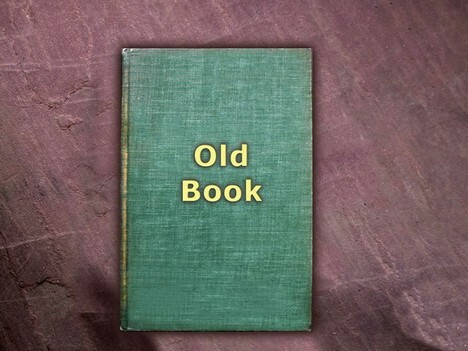 Oh my, I just got rid of a bunch of old books. Now I will have to buy more at yard sales to make this. Wonderful. This is a fun idea ~ it looks adorable! Now I am off to check our your Etsy shop. Cute blog, by the way. Smiles. This is so fun. Love the added touch of the bird. Congrats on your followers...you have a great blog...and this planter is such a cute idea...I've been following for a while and love visiting!!! The book planter is a great idea! I've never seen this done before! Nice vignette too! I've never seen anything like that made out of a book before! Terrific idea! What really makes the vignette though is how you placed those gorgeous birds - they look so natural in that setting! Well I can't add anything that hasn't already been said. I'm thankful I saw your post as I just this weekend came upon a bunch of old books at a sale, they are still in my trunk waiting for their fate. Now I know what that is. Thank you so much for posting, this is a quick easy idea and one I'll certainly give a try. That book planter is very clever! I love it! We appreciate you stopping by and joining us for Anything Related! I love it!!!! Will you make me one please, please,please?!!!!!!!!!!!!!! I am following you from FollowMeFriday. I just wanted to let you know I featured this over at While He Was Napping! Stop by and grab a featured button if you'd like. what a great idea! Now if only I could keep things alive! I'm terrible with plants. It's brilliant. Thanks for Linking up to Topsy Turvy Tuesday's! Love this idea. What a great way to reuse old books. I hope you can stop by my blog and show off your project to my readers on my Show Off Sunday Party. Visiting here from Better After...I'm now going to be as obsessed with your blog as I am with hers! :) You Rock! CRAZY creative! What a great idea! I'll be linking! A great way to use old books. Thanks for the instructions and a fresh idea to add in my archive. Keep up the good work! I really love this idea. What a cute way to use old books you can find for pennies when libraries have clearance sales. That is absolutely wonderful! How original! I'm definitely linking this blog site on my blog! I'm excited you're leaving a comment. I can't wait to read it...L.
This blog is mostly me just being me, doing the things I do everyday, only in the broad open light of day -- right out here in front of everybody! Yikes! Please give me credit and link back to my blog if you use my pictures or ideas. Thanks! Fall is in the thrift stores! Jingle Bells Turned Acorns? -- Sure! Boy's Oh So Cool Wall Art!